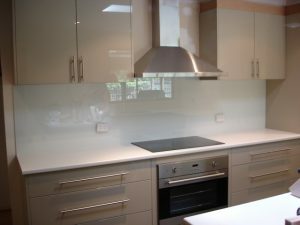 Glass splashbacks are a wonderful way to enhance the visual appeal of your kitchen or bathroom. They are easy to maintain and look simply stunning. A splashback in the kitchen helps protect the walls from stains, splatters and more as you lovingly prepare your meals, do dishes and more. There are a number of benefits to installing glass splashbacks. For starters, they are highly durable. A kitchen splashback is constantly exposed to food spills, water as well as dings from utensils and other kitchen appliances. A metal splashback can dent and a tile splashback will chip. They may also become stained if some specific substances stay on them for a long time. Glass splashbacks on the other hand do not crack, shatter or break. They also don’t stain. In fact, glass will look just like new even after years down the line. Moreover, glass is super easy to clean. A splashback is a huge and an obviously noticeable feature of a kitchen. That’s why, it’s crucial that you choose a splashback that’s visually appealing. Whether you are renovating or readying your new home, glass splashbacks are a great way to add a slick, contemporary touch to your kitchen. Lawrence Leadlights has been in the glass and glazing industry for more than 32 years. With extensive knowledge and expertise in the field, we bring to you a wide collection of high quality glass splashbacks. Whether you are looking for toughened splashbacks, textured glass or colour glass splashbacks, we have you covered. With a wide range of colours, textures and finishes to choose from, we have you spoilt for choice. Each piece of glass is measured accurately to fit precisely into its position. The paint application comes with a lifetime warranty.